It's a hot and humid day in The Peg so time to bust out linen. I scored this Ann Taylor linen/cotton blend sleeveless floral top at Value Village and it's perfect for a day like today. I love the cheery floral colors, the neckline and the wide straps. 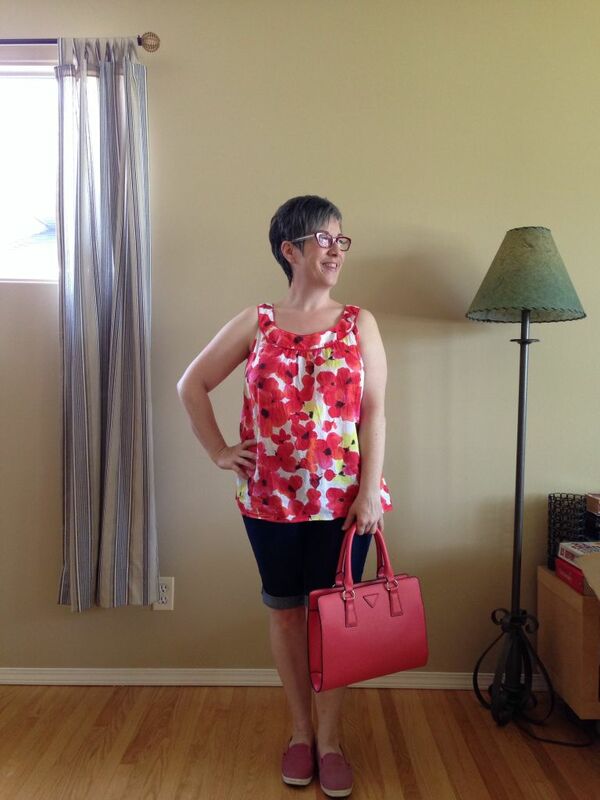 I've paired the top with my dark wash slim cut offs, pink Vans and my watermelon handbag. Can't get enough of this purse! I'm heading out to the pet store to pick up food and them meeting my BFF at her place for lunch on her patio. DS is recovering extremely well from his surgery and we're all adjusting to Gain no longer being with us, including Dusty Bottom. My son is having all four wisdom teeth out as well as a small piece of jaw bone due to damage created by one of those wisdom teeth - we're getting ready to head out to the hospital. It's a day procedure done under conscious sedation and we have the best maxillofacial surgeon in the city doing it. But still…it's my baby, you know? So what does a mother wear to take her son for a procedure and then have to bring him home a few hours later? It's got to be something I don't mind getting bodily fluids on (if you know what I mean), and I need to be able to move around easily and not fuss 'cause he's 6'3" and will be kind of "out of it" when I'm trying to get him to the car and then in the house. Plus it's crazy hot and humid here today. I started with these new-to-me cut off shorts. I had a pair of bootcut jeans that I wasn't crazy about in terms of how the legs fit and the length so hacked them off last night and they make perfect slim fitting denim Bermuda-style shorts. 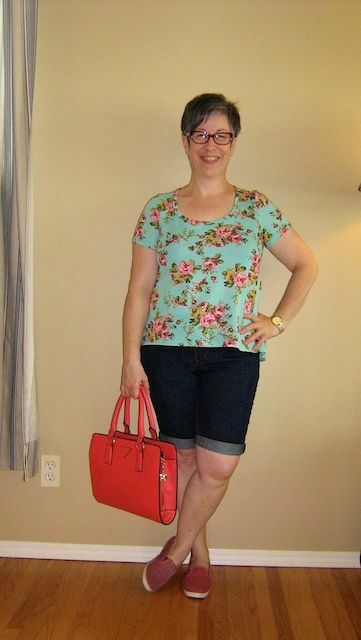 I then paired those with an old but still loved floral tee with hi-lo hem, my cinnamon-pink Vans, watermelon handbag (so glad I bought this pretty little number!) and gold watch. Red specs finish it off. I think this is a definite case of dressing for the occasion. Does it still look ok? As always, all comments/suggestions welcome. I'll be checking in sporadically over the next couple of days so my apologies ahead of time if I don't respond right away. Today's outfit debuts two of my new Eileen Fisher pieces I have purchased on my way to curating a more comfortable, stylish and somewhat simpler wardrobe. First up we have a grey silk/cotton blend asymmetrical drapey tank. I love that this isn't sheer and yet is so light weight you don't even feel it on. It's also perfect in that it's not too low cut to wear to work, has great bra strap coverage and the underarms are cut high enough that there's no worry about wardrobe malfunction. This will be a great summer piece for casual wear on its own and then with a blazer or cardigan at the office. 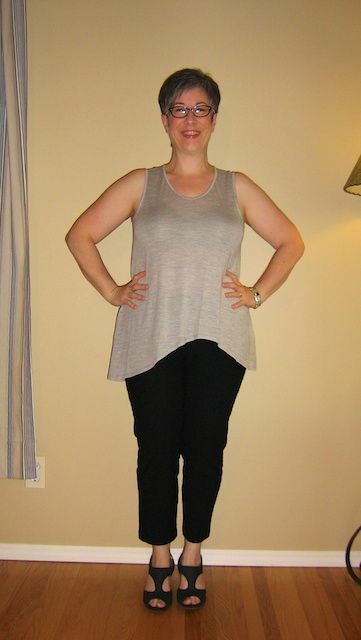 I've paired the tank with my new EF cropped slim fit pants in a fabulous feeling silk/cotton/crepe blend. Ridiculously comfortable. These are petite in length but I'm wondering if they need to be slightly shorter? I know Angie that you like ankle pants to truly show ALL the ankle. On top of these wonderful pieces, I've popped on my trusty black suit blazer. This black skirt suit was an excellent purchase. Even though I've discovered that my office has only a rare need for a full on suit, the pieces break up perfectly to wear as separates. The blazer makes this tank more appropriate for work but allows the asymmetrical hem of the tank to peek out and make the outfit more visually interesting. Accessories include my watermelon handbag, silver watch and bracelet and my black/white specs. I've also chosen my black high vamp heeled sandals for footwear. Still missing Gain like crazy and the house doesn't seem the same. So I made a conscious decision to dress in cheery colours to help me feel better. Today's outfit started with my cobalt blue pencil skirt. 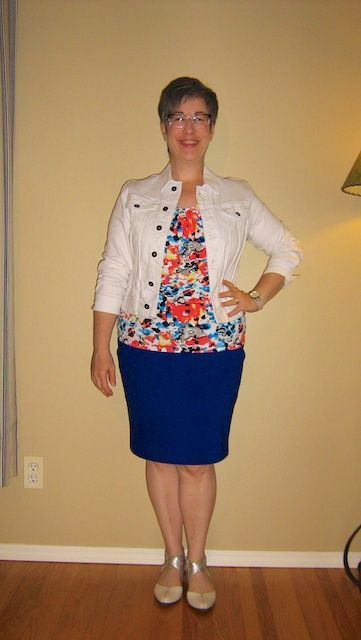 I added a multi coloured tank in an abstract pattern and then topped that with my white denim jacket, with scrunched sleeves. For footwear, I went with my comfy bone/silver sandal shoes and for my handbag, am debuting my new coral/watermelon coloured satchel. I actually bought this yesterday from the hospital gift shop - it was in the window and the colour just spoke to me. For non leather, the quality is quite excellent. It's a fun piece to add for the summer. For accessories, I chose my purple/clear specs and my silver/taupe wrap watch. It actually does help to dress in happy colours. There is nothing new or cutting edge in this outfit - does it still look current? What do you think? Does it all work together? As always, all comments/suggestions welcome. Only in Winnipeg can you go from -50 Celcius to +32 Celcius in a matter of weeks! It is hotter than a pistol here today and I'm LOVING IT!!! We always say no one appreciates a summer like a Winnipegger. I'm heading out to pick up my tomato plants at the nursery and some almond butter at the organic food store. 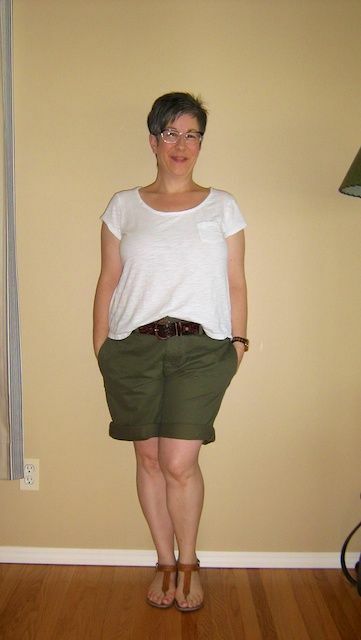 I'm debuting my slouchy khaki shorts - they are too big on me and fall off without the belt, but I love the slouchy ease of them for the heat so bought them this size on purpose. I realize they won't be to everyone's liking but I'm digging the fit. When I bought the shorts, I also picked up this light weight white tee that also has some ease in the fit. The outfit would be too sloppy looking without the semi tuck, which helps to provide some structure. I went with my vintage men's tribal leather belt to hold up the shorts and bookended the natural brown tones of the belt with my caramel toned leather sandals. Purple/clear specs and my rose gold/black watch finish off the outfit. What do you think? Too much slouch and volume or just flattering enough (JFE)? As always, all comments/suggestions welcome. P.S. I just realized this picture would have been much more flattering without my hands in my pockets. I don't know why I do that for pics! I don't use the pockets otherwise. Weird. In my gigantic purge last week, I came across this silk-linen blend teal pullover that I thought I had lost. It had gotten squished behind the other pullovers on my closet shelf and was basically shoved between the shelf and the wall. I was thrilled when I came across it because this fits in with my new comfort and fab fabric style direction. So today's outfit started with the teal pullover. I should note that I am wearing a white camisole underneath the pullover because of its sheerness and I'm not sure that it's photographing well as a result. 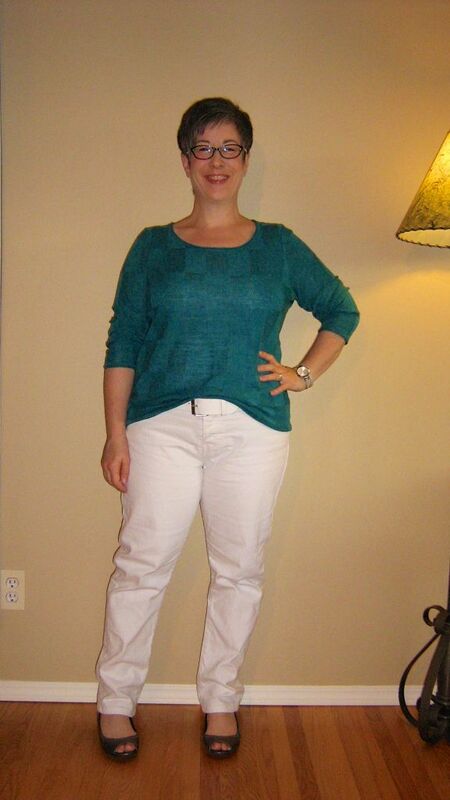 I faux tucked the pullover into my white leather belt, which is holding up my TR Brianna white BF jeans. I'm wearing the jeans full length today 'cause my A/C in the office yesterday was positively frigid (they are working on fixing it) and there was no way I was baring my ankles. For shoes I went with my pewter wedge peep toe pumps which echo the silver buckle on my belt and the silver in my watch. They look a bit dark I think but I didn't want to wear my cream oxfords and my feet needed a break from the bone/silver sandal shoes - so I'm going with these. I kept the large cream handbag I used yesterday and my silver wrap watch again (love this watch!). 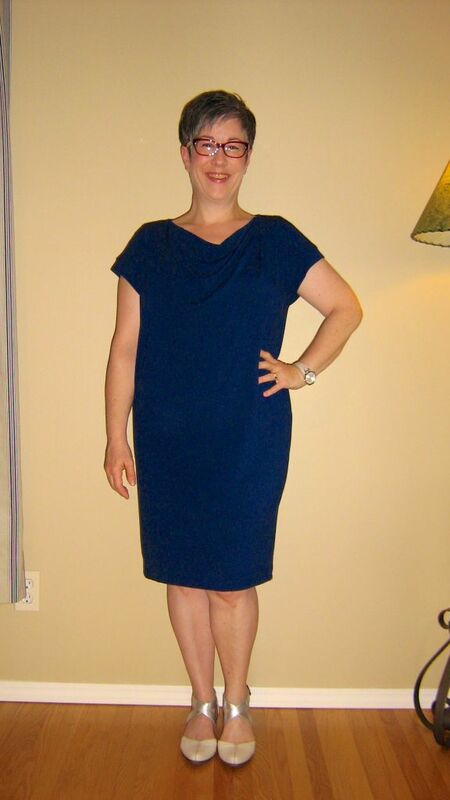 Today's outfit started with my blue EF drape front dress - easy, comfortable, figure forgiving and still stylish. What more can you ask for? On top of the dress, I added my crisp white blazer, with scrunched sleeves and then chose my bone/silver sandal shoes to bookend the light colour of the blazer. I chose my large cream handbag and taupe/silver wrap watch for accessories and finished off the outfit with my red specs and watermelon shade lipstick. I feel like this outfit is a perfect combination of fluid and structure. What do you think? Does it work together? As always, all comments/suggestions welcome. Oh Angie…I can't tell you how happy I am that Birks have somehow found their way into the trends and become stylish. My weird little high volume feet LOVE them :) I'm also completely enamoured with the Birks with skirts/dresses trend - you just never know what's going to strike your style fancy do you??? To finish off the outfit, I added a pop of citron with my small leather clutch, my taupe and silver wrap watch, red specs and swipe of watermelon coloured lipstick. Yep. This feels like ME. So I'm interested in hearing what y'all think of the Birks with a midi on short me. Do you think it works? Does the outfit work as a whole? As always, all comments/suggestions welcome. Today's outfit started with my Earhart Aviator trousers - comfortable, not traditionally flattering and full of volume. I paired the trousers with a simple black scoop neck tank, fully tucked with my black leather belt. 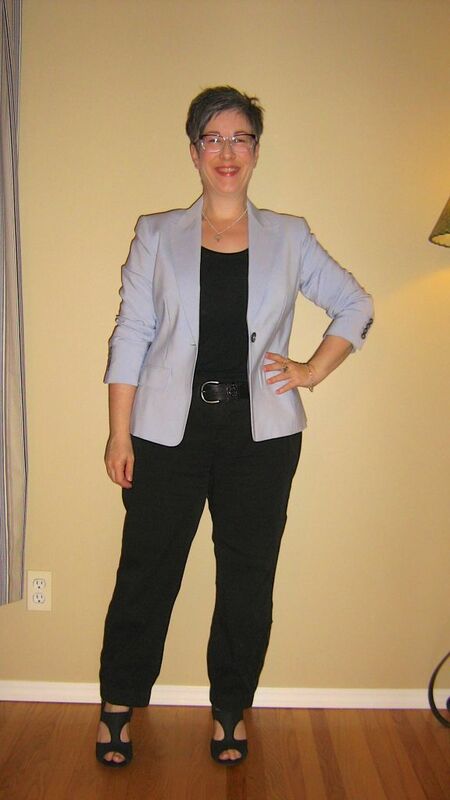 Because of the volume these trousers create on the legs, I need to add an element of structure to my top half so as not to feel all frumpy - this is achieved here by both the fully tucked tank and the blazer. On top of the tank, I popped on my pale blue blazer (from my pastel blue suit) and scrunched the sleeves for even more structure. I'm debuting my new Clarks sandals (the replacements for the Fugitive sandal shoes). I love the high vamp on these because they can work to elongate my leg line when wearing black bottoms. I then chose my black patent fold-over clutch and purple/clear specs to finish the outfit. I'm digging the black and pale blue combination - it seems kind of unexpected, which I like. I'm also falling back in love with some of my jewelry and am wearing a dainty necklace today that my hubby gave me for Christmas. So what do you think? Does this all work together? As always, all comments/suggestions welcome. Today's outfit started with my olive cargo pants, paired with a white and blue striped drapey tee semi tucked with a black leather belt. 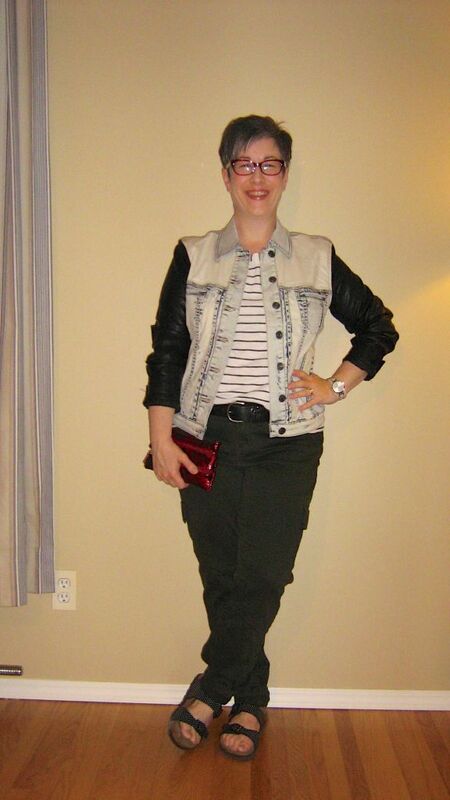 I then added my mixed media denim jacket (LOVE this jacket!) and popped on my new black and white polka dot Birkenstock sandals. To say my feet are happy in these sandals is a major understatement - finally…a trend that works with my physical attributes! To finish off the outfit, I went with my red specs and my small red snake print leather clutch/wallet, and my taupe/silver wrap watch and silver wedding band. ETA: Here's a pic of my "wee boy" (all 6'3" of him!) just as we were leaving. He lives in his jeans and has several fits, brands and washes and also has a shoe addiction, which he freely admits.